Need fast dinner ideas due to a meal planning fail? Maybe you burned your casserole in the oven, forgot to turn the crockpot on (or plug it in—been there), or forgot about dinner until five minutes before. If this has happened to you, you know what happens next—you end up ordering pizza, calling for takeout, or driving to the nearest fast food joint. Well, never fear! I’m sharing some insanely fast dinner ideas for when meal planning doesn’t go as planned—so you don’t end up spending MORE money on dinner. 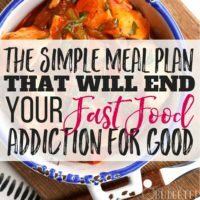 Avoiding fast food and eating more meals at home will really help you save money. But I totally get it: it’s not always easy. Sometimes plans go wrong. Life happens and dinner doesn’t come together. Sometimes you totally forget dinner is even a thing. By having a few “backup” fast dinner ideas in your head, you'll be more likely to stick to your budget. You CAN create a totally acceptable dinner with items in your freezer and pantry, without spending tons of time cooking or stressing out. Will this dinner be your greatest culinary achievement? Well, probably not (okay, definitely NO), but it WILL feed your fam just fine. Here are some fast dinner ideas to help you figure out what to eat for dinner without derailing your budget. Whether your fridge is full of half-servings of leftovers, you’re hoping to pull a meal together with ingredients in your kitchen, or you’re just looking for fast dinner ideas, I’ve got you covered! Let’s explore “Plan B” fast dinner ideas! When you start to meal plan, chances are high you’ll end up with little amounts of leftover food. Little bits of this and that—not enough for an entire meal for the family, but enough for a serving or two. Based on an awesome reader tip, we started having smorgasbord nights where we used up all these random leftovers (along with a few other ingredients on hand). I ate leftover garlic chicken breast, caprese salad with a little block of mozzarella we had left, and 3 ingredient banana pancakes. Jon ate half of a steak, banana pancakes, and a BLT sandwich. See what I mean? We have smorgasbord nights at least once a week now and it means good food doesn’t end up going in the garbage. That's right: NO wasted food! It's kind of amazing. Sure, we eat eclectic and weird meals occasionally, but they’re also kind of fun. Plus, hello! It’s ridiculously easy to heat up leftovers—all you need is a microwave! 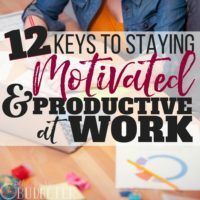 This leaves more time for hanging out and doing fun stuff rather than cooking! Our smorgasbord nights are one of my favorite fast dinner ideas I've ever had. Well, turn your leftovers into awesome TV dinners simply by plating everything up into nice meal-sized portions, just like you'd fill up your plate on Thanksgiving. Cover the plate with a few layers of plastic wrap. Then cover the meal again with tinfoil. Put it in a freezer bag, or vacuum seal and freeze (but be sure to label it). When you’re ready to enjoy your TV dinner, you simply uncover the plate, remove the tinfoil, and pop it in the microwave. In a few minutes, enjoy a great plated up meal of your choosing. Anytime you’ve got leftovers, turn them into TV dinners, and you’ll have plenty of variety to pick from when dinner plans fall flat (or when you just don't feel like cooking). Maybe you want macaroni & cheese with meatloaf, while your husband wants chicken nuggets and mashed potatoes! Go for it! Save leftovers as microwave dinners, so there are options on hand when your meal plans go awry. Pick an item from the freezer, heat and enjoy! Another one of my favorite fast dinner ideas? Go for a sandwich bar! If you’ve got bread, turn any ingredients into a sandwich. No bread? Use a tortilla or wrap! Seriously like anything can be turned into a sandwich! Leftover spaghetti sauce, meatballs, steak, chicken, ham and turkey all become yummy sandwich and wrap fillings. With cheese, you’re a few minutes away from an awesome, creative grown-up grilled cheese (that won’t taste like leftovers). Have several leftover items? Let everyone customize their own grilled cheese invention! Store several cheese types on hand for the go-to grilled cheese or quesadillas. The greatest hack with grilled cheese is that you’re able to toss in all sorts of leftovers and extras to really dress it up (and use up items in your fridge). Throw in veggies or protein and you’ve made a satisfying sandwich. Now that's comfort food. Even if there’s no leftover meat to add to your sandwich, use veggies with hummus or cream cheese for a great sandwich filling. Use avocado, tomato or even mashed chickpeas on toast or spread on a tortilla. Roll them up for an easy wrap. Be sure to keep peanut butter on hand along with honey or jelly, as an option (which are great with crackers in a pinch). Cans of tunafish or chicken easily mix with mayonnaise, mustard or even sour cream for a quick filling too. Sandwiches are simple and crowd-pleasing! If you’ve scrolled through Pinterest or Instagram recently (or even looked at a cooking magazine) you know noodle & rice bowls are super popular fast dinner ideas. They look and seem fancy—like you went to Noodles & Co., or even a dressed-up ramen restaurant. The secret about bowls is they’re really really easy. Literally, cook food, put it in a bowl and enjoy! They usually consist of a base—like pasta, rice, veggies or even spinach or lettuce. Then they include whatever vegetables and protein is floating in the fridge. Pour on sauce or dressing, sprinkle on nuts, seeds, croutons or even crushed up tortilla chips for crunch, and you’ve created a pretty meal that comes off as way fancier than the effort (‘Stagram snap optional). If you’re wondering what to fix for dinner, especially if you ‘ve got a little bit of this and that, but not enough for a whole meal, consider stretching it out with rice, pasta or greens. Cook macaroni and cheese and stir in leftover steak, ham, barbecue or buffalo chicken, or even tuna and frozen peas. Turn leftover chicken and vegetables into a “stir fry” by heating up (or even eating cold), adding sesame dressing or teriyaki sauce and eating over rice, spinach or even noodles. Use up all sorts of leftover dishes this way and it takes only the effort to microwave a pack of instant rice, boil pasta or throw lettuce in a bowl. Stock up on meal components to fix and eat in a pinch. Peanut butter crackers are a great one. Chicken or tuna salad, a few canned soups or jarred pasta sauce. Keep these items on hand in your pantry. Whenever dinner throws you a curve ball, you’ll be ready. These options are great because they’re shelf-stable. You don’t need to worry about them going bad or expiring in the fridge. They will last a looooong time. They’re quick, easy and will satisfy most members of your family. Go with the items your family loves—if they love boxed mac & cheese, keep a few boxes on hand. If your kids can’t get enough spaghetti and marinara, keep the ingredients in your pantry. Think of your favorite easy-to-store, shelf-stable options and buy them ahead. Like your pantry, your freezer is another great option when you need some fast dinner ideas. 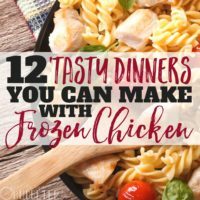 If you haven’t tried freezer meals yet, I want you to give it a shot! They’re easy! Cooking ahead and storing your meals means there’s a supper to heat and eat on any given night. Some nights though, you might forget to pop your meal in the crockpot or you don’t want to wait for it to come out of the oven. Some nights you might simply feel like a low-maintenance option. Now, I know frozen pizza for dinner doesn’t seem like a great substitute for fast food, but if I will keep you on track (and out of the drive-thru and stickin' to your budget), then I want you to pick up a few to store in your freezer. Maybe you love Lean Cuisines (shout out Santa Fe Rice & Beans—you’re my fave)! Maybe your kids go crazy for chicken tenders or pizza rolls. While you might not want to serve these items every night, it’s certainly cheaper and easier than going to a restaurant. Most of the options clock in under $10 for a family of four, which is less than you’d spend at McDonald's. Do yourself a favor and keep a few instant meals in your freezer. Use them as an option when you don’t feel like dealing with dinner. As you get more comfortable with meal planning make freezer meals of your own. They’re so easy—cook once and eat all week (or month) long. Always keep a few freezer meal options on hand to heat up fast, in case you forget to put supper in the crockpot. Soups, sloppy joes and make-ahead proteins are typically quick fixes. Mix it up! There are no rules saying you must eat certain foods at certain times of the day. If you’ve got a box of cereal, frozen waffles or eggs, break ‘em out! “Breakfast for dinner” is a super fun option! My kids love the “wacky” idea we’re eating cereal for dinner (hey, why not?) and it’s a simple, easy solution to the dinner conundrum. If you’ve got pop-tarts, breakfast bars or if you like making smoothies, enjoy them for dinner once in a while and life will be easy! 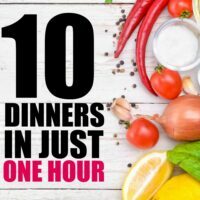 Other non-conventional, fast dinner ideas? Eat snacks for dinner: popcorn, chips with cheese melted on the top or another “treat” you wouldn’t normally eat for your evening meal. Life is short! There’s no reason to sweat the dinner question. Once in a while it’s perfectly okay to eat a crazy dinner, especially if it keeps you on track. But sometimes even our best laid plans don’t work out. Plan ahead with these last minute fast dinner ideas so you stay on track…even on those nights when life turn out a little differently! What are your favorite “Plan B” fast dinner ideas? Do you have great recipes to use up leftovers and avoid fast food? Thanks for these awesome tips. I made a chicken sandwich for dinner not too long ago using my last 3 grilled chicken tenders, a drizzle of BBQ sauce, lettuce and tomato. It was delicious and took all of 2 mins to prepare. I didn’t spend extra money and I didn’t waste my food. Win-win! We sometimes do “appetizer night” in our house. Could be sliders, nachos, pretzels bites … basically any kind of “bar food”. Not exactly the healthiest, but it’s a nice change sometimes and costs less than getting something from a restaurant. 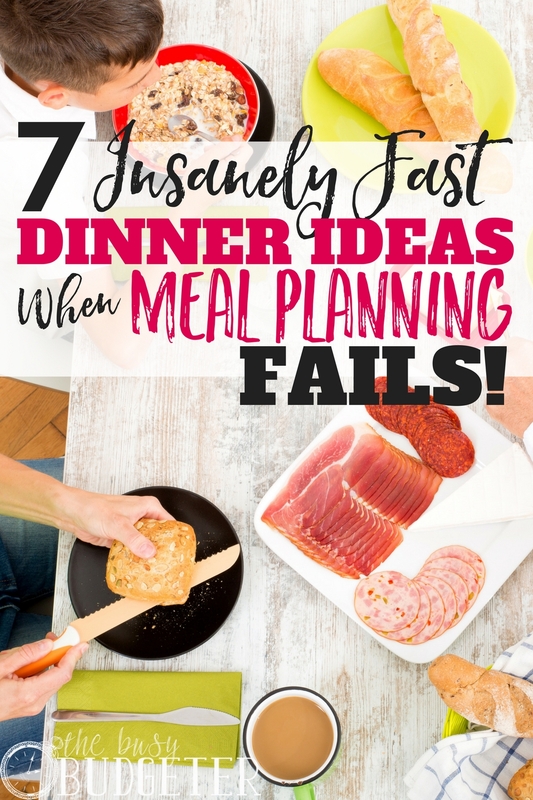 We have meal planning fails more often than we’d like to admit! Our family is very good at using leftovers. In fact, we pack leftovers for my hubby, baby, and me every day. Sometimes when we run out of leftovers and are in a rush, we will revert to instant noodles or dry noodles >_< I will need to implement some of your ideas since they all sound great! We have breakfast nights too! Great ideas to clean out leftovers and have a quick inexpensive meal!! Thanks for the great post! I recently did freezer cooking casseroles and put them in mini-loaf pans for single servings. They have turned out awesome! They have saved me from going through the drive-thru’s multiple times now. I always find something to learn at your place ! Thank you ! I love smorgasbord nights! I call them “round-up nights” in our house. We round up all the leftovers and create a meal from them just like you do – it helps provide dinner in a pinch while preventing us from spending more money (going out) or wasting food (and money) by throwing it all out! We also do breakfast dinner nights. Usually, it’s breakfast burritos or burrito bowls because I always have eggs and bacon and black beans on hand. That makes for a quick (cheap) dinner, and we love it! My favorite go to dinner is tacos or taco salad. I usually have a bag of cooked rice in the freezer that reheats really well with just a little water and then I can add a can of black beans – a good option and protein alternative if you dont have time to cook meat. 1 lb of ground beef can usually be defrosted and cooked by the time you prep the rest of the ingredients. Start to finish 20 min and a meal that most will enjoy! You don’t even have to have wraps – just make it into a Mexican salad or eat with chips as another alternative. A new friend shared with me that her family does “soup night”. Everyone picks their favorite canned soup and eats it from their own special soup mug with a side of crackers or toast. Why didn’t I think of that? These are such good ideas and actually sound more fun than a regular meal! I love having just a little of this and a little of that, so definitely have to try this! I may even plan one night a week to be a leftover smorgasbaord dinner! Thanks! These are really good ideas. I swear, every time I use my slow cooker I forget to plug it in lol.